Research Challenge 2 concerns Skyrmion Science: the basic physics of skyrmionic states of matter. Before skyrmions can be exploited in devices it is necessary to understand their properties, potentialities and their status within the general framework of fundamental physics. The skyrmion is a topological defect much like the magnetic domain wall and the superconducting vortex. If skyrmions can be made energetically stable they should occur within many systems showing broken symmetry and show a characteristic set of excitations. How do skyrmion phases occur and what determines the form of the skyrmionic texture? At one time, magnetic skyrmions were thought only to be realised in B20 magnetic systems. Recently it has become clear that a far richer variety of skyrmion textures may occur in a diverse range of systems. These textures include not only the Bloch-like skyrmion occurring in B20 chiral magnets but also the Neel-type skyrmion. In bulk materials, the skyrmion lattice (SL) phase generally occurs within a narrow region of the applied magnetic field-temperature phase diagram. The reason for this, the nature of the phase transition, the possibility of precursor phases and the critical behavior on entering the skyrmion phase all require detailed study. We will investigate phase transitions and skyrmion textures in a variety of materials using a broad range of experimental techniques and theoretical modeling. How does dimensionality affect the skyrmion? When bulk, crystalline samples are thinned the skyrmion phase becomes more stable, extending over a greater range of temperatures and applied magnetic fields. However, the observation of skyrmions in thin magnetic films has proved highly controversial, with no widely accepted observation of skyrmions in such films. The latter is of extreme importance since the manipulation of skyrmions in devices will most likely rely on magnetic thin-film technology. We will investigate the confinement of the SL along with the phase diagrams and spin textures realized in films. How does the skyrmion evolve on different scales? It is expected that the skyrmion phase should promote a range of emergent physics. Using our suite of technique we may probe the excitations of the skyrmion phase on a number of length-, time- and energy-scales. There is also recent evidence that the extent of the SL phase is dependent on sample cooling rates, with quench-cooling stabilizing a larger skyrmion phase. Investigations of non-equilibrium effects will allow us to stabilize these objects under a variety of conditions. How robust is the skyrmion and the SL? Little is known about the effects of disorder on the skyrmion phase. Disorder may be introduced chemically, by patterning defects with a FIB, or through neutron irradiation. Materials such as the B20 chiral magnet MnGe are thought to host disordered skyrmion phases formed from randomly oriented helices, but this disordered phase remains poorly understood. Our starting point is to exploit the similarity between the skyrmion lattice (SL) and another topological defect state: the vortex lattice (VL) in type-II superconductors. This approach has allowed us to identify a powerful set of probes and tools for use in the project. Transmission Electron Microscopy Magnetic imaging techniques (known collectively as Lorentz microscopy) are based on the fact that the Lorentz force from internal magnetic fields deflects electrons as they pass through a material, altering the phase of the electron wavefunction. We have used the technique to measure the magnetic profile of individual flux vortices in the superconducting VL and track magnetic phase transitions. Electron microscopy is the only imaging technique which gives information on the internal magnetic structure of the SL rather than just the stray field, and allows imaging at video rate. Using x-ray diffraction we can study magnetic superlattice reflections such as magnetic spin density waves and antiferromagnetic and incommensurate reflections. We will use polarized soft x-ray diffraction, where we measure the polarization of the scattered x-rays to provide element-specific information on magnetic anisotropy. Neutron diffraction techniques have an advantage in examining large-scale magnetic structures such as SLs in that they produce data corresponding to the morphology of the field distribution in the bulk of a sample rather than a surface view provided by many methods. Inelastic scattering provides a probe of skyrmion lattice dynamics. Low energy excitations have been predicted in SLs, as has the dispersion of phonons, which can be tested by neutron scattering. Inelastic neutron scattering can be used to study phonons, magnons and other quasiparticles in magnetic systems and how they are altered by the magnetic texture such as magnetic helices or skyrmions. 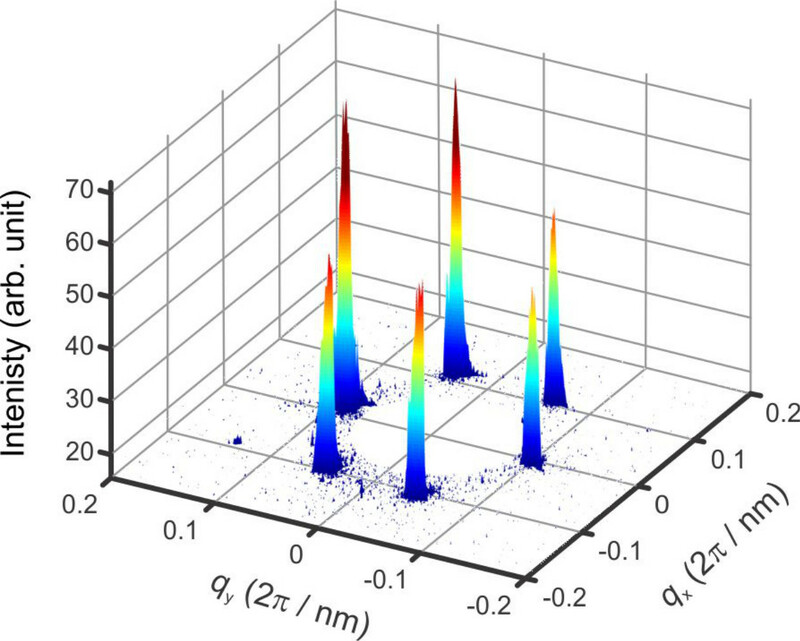 The improved intensities of soft x-ray L edges allows inelastic x-ray scattering with much-increased energy resolution, down to the level where phonon modes can be explored. Muon-spin rotation provides a means of accurately measuring the internal magnetic field distribution in a material through the implantation of spin-polarized muons. The technique is often used to provide key measurements of superconducting penetration depths and vortex lattice melting, and we have shown that the technique allows an insight into the physics of the SL. Underpinning theoretical work will guide and allow us to understand our experimental results. We will employ state-of-the-art multiscale theoretical and computational methods applicable in broad ranges of time, length and energy scales, and big data analysis tools, to understand the fundamental aspects of skyrmion physics. This work will involve first principles calculations, such as DFT, to identify the physics at play, followed by modeling and calculations of static properties and excitations such as magnons and phonons. Techniques to be employed in this Challenge include: (i) lattice spin models and Monte-Carlo simulations to establish phase diagrams; (ii) Langevin spin dynamics simulations to probe skyrmion lifetime and dynamics; (iii) micromagnetic simulations to model confinement effects and interactions with defects; (iv) micromagnetic, Monte-Carlo and large-scale spin dynamics simulations to model skyrmion interactions, long time-scale dynamics of the spin textures. Spin models will also be used to compute the static and dynamic structure factors to directly support scattering experiments.